Here is a copy of the permission slip for our field trip to Square 1 Glass Blowing Studio in Milwaukee. Make sure this is turned in by Monday, May 11th 3:00 p.m. Remember that we meet this week on Wednesday, April 15. 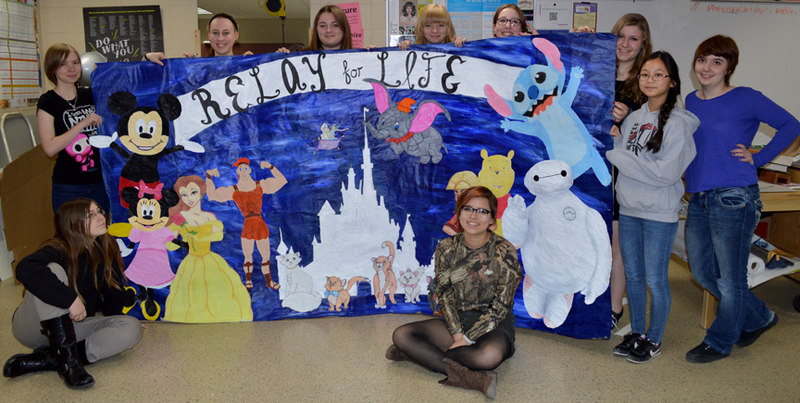 We are needing to finish the Relay for Life Mural as the event is next week. Please make sure you are there on Wednesday from 3:00-4:30. We also currently don't have a snack schedule. Hoping maybe Katelyn could organize this using the schedule below for dates. See the Schedule Below for the rest of our meetings. 5/26 - TUESDAY FIELD TRIP TO SQUARE ONE GLASS BLOWING END OF YEAR PARTY. We will leave school at 1:30 and take the two school vans. There will be 14 spots available in the vans (first come first serve) More details and permission slips will be coming soon. The cost will be $35.00 per student for glass blowing, plus $5.00 for party food. This will be our last meeting and activity for the 2014-15 school year. Next week Art Club will meet at 3:00-4:30 on TUESDAY, March 31st instead of our usual Wednesday date. Please make sure you are there as we will be getting started on the Relay for Life mural. We hope to get it drawn out onto large paper and maybe get the background painted. It looks like nobody is signed up for snack so maybe someone could bring something! See you Tuesday. Please plan your rides and be at the Brookfield Square Barnes and Noble store on Wednesday, March 18th at 3:15. We will be hanging the art exhibit for the high school and assisting the middle school and elementary if those teachers need help. We will be at Barnes and Noble until about 4:30/5:00. Please make sure you have a ride home. The reception for the exhibit is Friday, March 20th and the take down of the exhibit will be Wednesday, March 25th. We will meet again at Brookfield Square Barnes and Noble as a club and take down the show. We will probably only be there until 4:00/4:30 as take down doesn't take as long as putting up! See you then. Check email for details. Voting for Winter Ball Representation from Art Club, Tile grouting, new ideas...what do we want to do? Crafts? ???? March 25 Meeting at Barnes and Noble at 3:00 to take down the Exhibit. Get your own rides. We will be finished by 4:00. Here's the link to the Christmas snack list. Please sign up for the snack you want to bring. Bring enough for 15-20 people. Please come and help us paint the drama painting! We need your help for these additional dates. The Art Club recently painted and refurbished the PHS Visual Art Gallery space which is adjacent to the cafeteria. This was the first of our activities with the group. 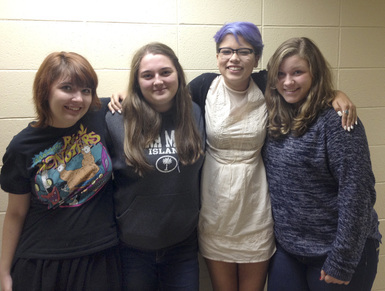 Art Club welcomed several new members for 2014-15. We also elected officers and began planning the rest of our activities for the school year. The newly elected officers include: Kelly Kempen, President, Kierra Schwab, Vice President, Katelyn Elvers, Secretary and Jenna Anderson, Social Media Coordinator/Photographer . For a list of upcoming meeting dates and the snack schedule see the news below. 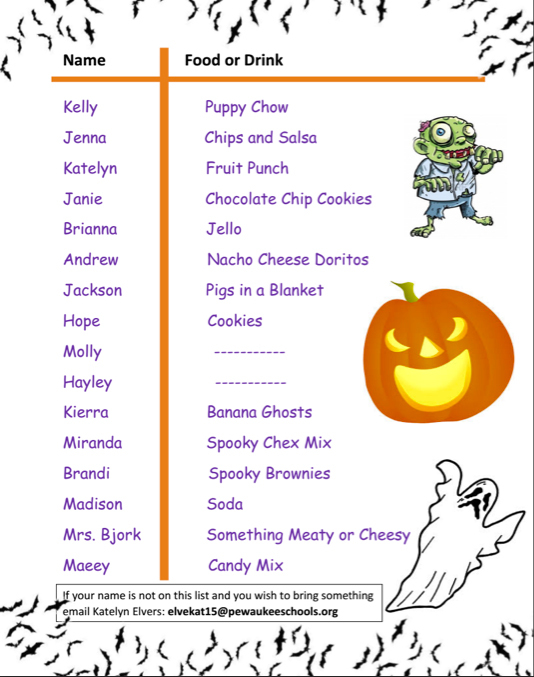 October 29 3:00-4:30 HALLOWEEN PARTY!!! We will have an informational meeting on Wednesday, September 10th from 3:00-3:30 in room 114. You will have the opportunity to learn more about the club and hear from past members who have been members. Bring your application for membership to this meeting along with the $15.00 fee. Checks can be made out to PHS ART CLUB.